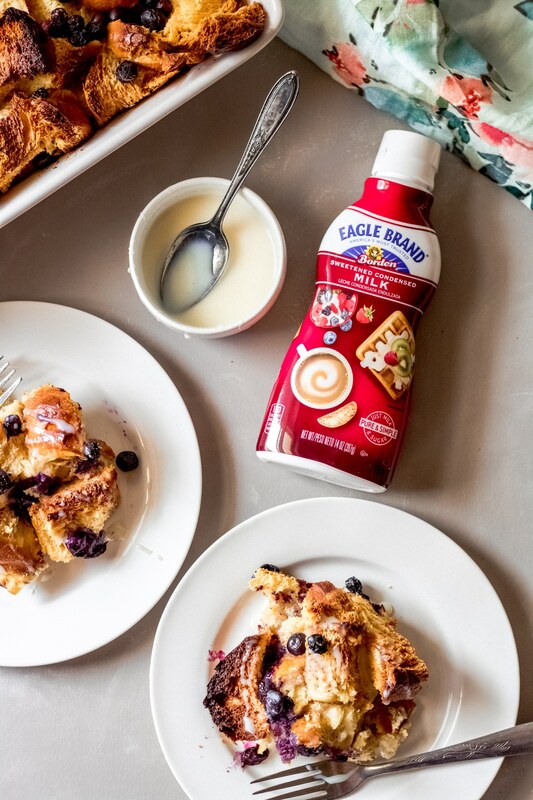 Mother’s Day is the perfect time to show mom just how much you appreciate her—and what better way than to serve her a delicious blueberry french toast bake featuring Eagle Brand® Sweetened Condensed Milk? This breakfast casserole is easy to make, plus the Eagle Brand® Sweetened Condensed Milk gives it a deliciously rich flavor—almost like bread pudding! 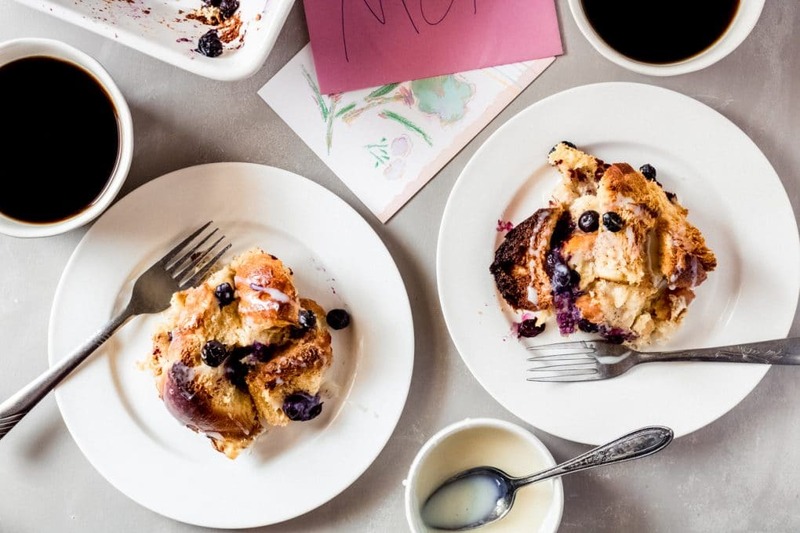 This Mother’s Day, pamper mom with a gorgeous brunch spread: coffee, fresh flowers, a heartfelt card, and a tasty blueberry french toast bake. I’m sure she’ll absolutely love it. I don’t know about you, but nothing says I love and appreciate you more than a delicious meal cooked from the heart. 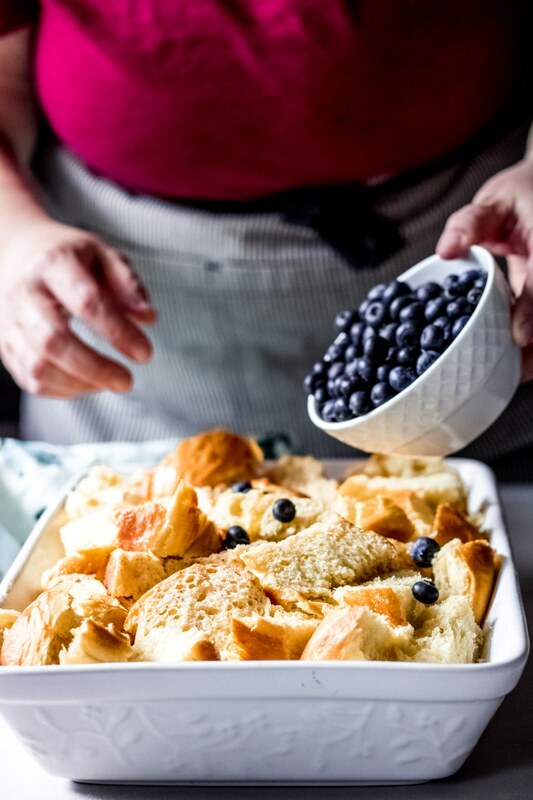 One of my favorite brunch recipes to cook is an easy breakfast casserole—and this blueberry french toast bake is precisely that! 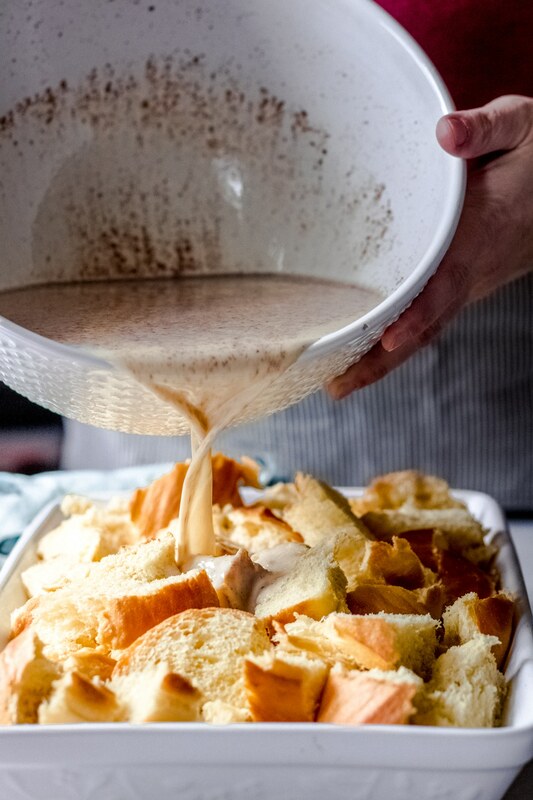 With thick brioche bread and the pure milk + sugar found in Eagle Brand® Sweetened Condensed Milk, you’ll turn a delicious dish into an amazing meal to share with your family this Mother’s Day. 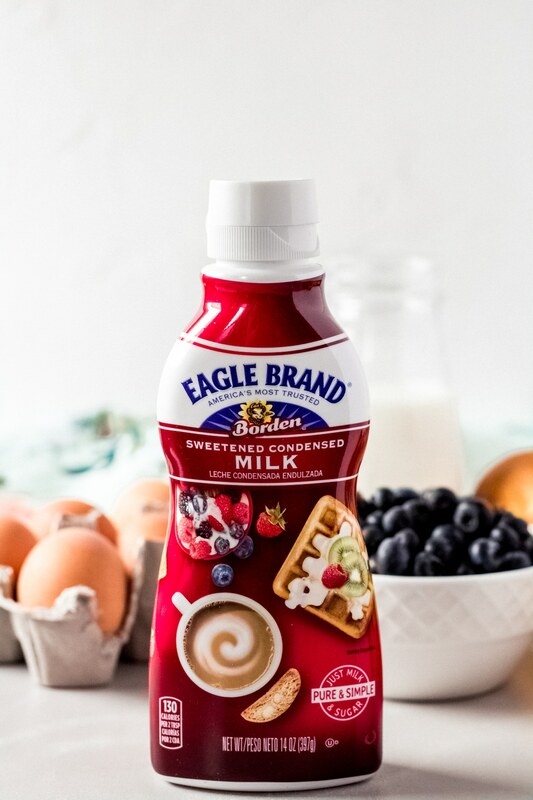 Eagle Brand® Sweetened Condensed Milk can now be purchased in a squeezable bottle! Amazing, right?? Their squeezable sweetened condensed milk has the same great taste as in the can, just now in a convenient bottle. Which is perfect for this recipe because it makes it much easier to reserve a few tablespoons for that final drizzle before serving. You can use their easy to navigate Store Locator page to find out which store near you carries Eagle Brand® Squeeze Sweetened Condensed Milk. 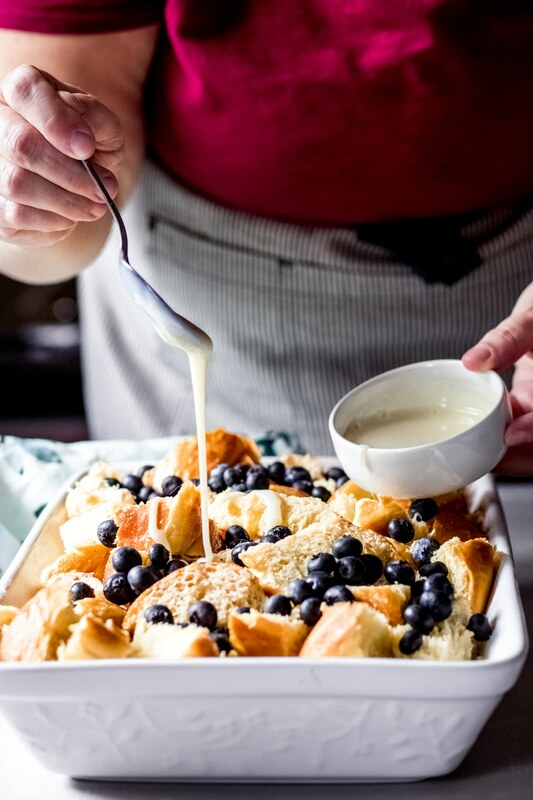 With this dish, I love to squeeze some of the sweetened condensed milk right onto my bake- when we have guests I’ll simply squeeze some into a dish. Some of my favorite desserts are made with Eagle Brand® Sweetened Condensed Milk—like my Gluten-Free Key Lime Bars. Eagle Brand® Sweetened Condensed Milk can help you bake fuss-free, delicious treats so you can spend more time with your family. 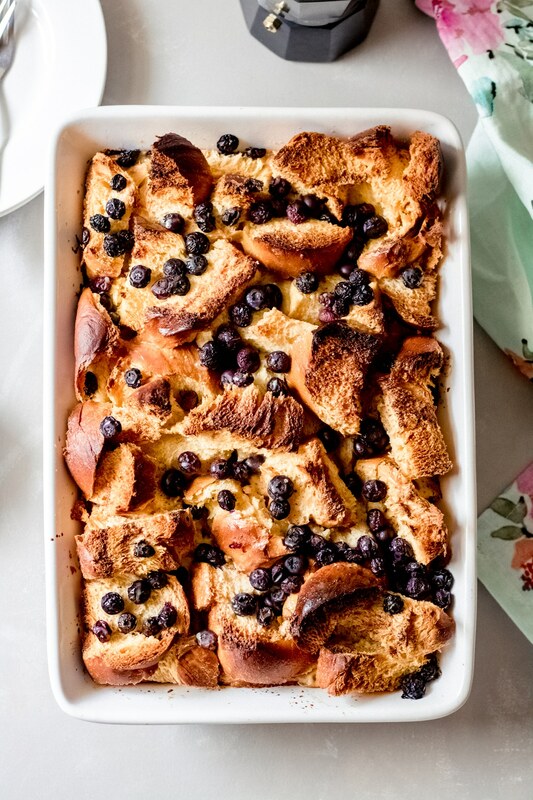 This Mother’s Day, spend quality time with mom with an easy, fuss-free blueberry french toast bake. Squeeze one cup of Eagle Brand® Sweetened Condensed Milk into a 1-cup measuring cup. In a large mixing bowl, add the whole milk, eggs, cinnamon, and salt. Whisk to combine. Then, add in the one cup of Eagle Brand® Sweetened Condensed Milk and whisk to combine fully. Reserve the remaining sweetened condensed milk for later. Cut the brioche loaf into large squares and add to a greased 9X13 baking dish. Pour the milk and egg mixture over the bread cubes. Top with the fresh blueberries. 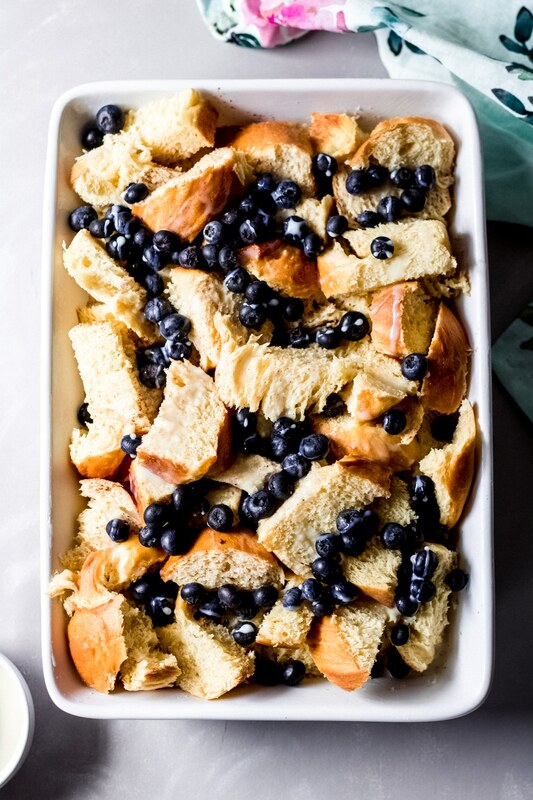 Drizzle about one tablespoon of the reserved Eagle Brand® Sweetened Condensed Milk over the top of the blueberry french toast bake. Place into the preheated oven and bake for 60 minutes. Bake until a knife comes out clean from the center. If the top is browning too much, you can gently place a foil tent on top; do not seal the edges. When finished baking, remove from oven. Why Eagle Brand® sweetened condensed milk? 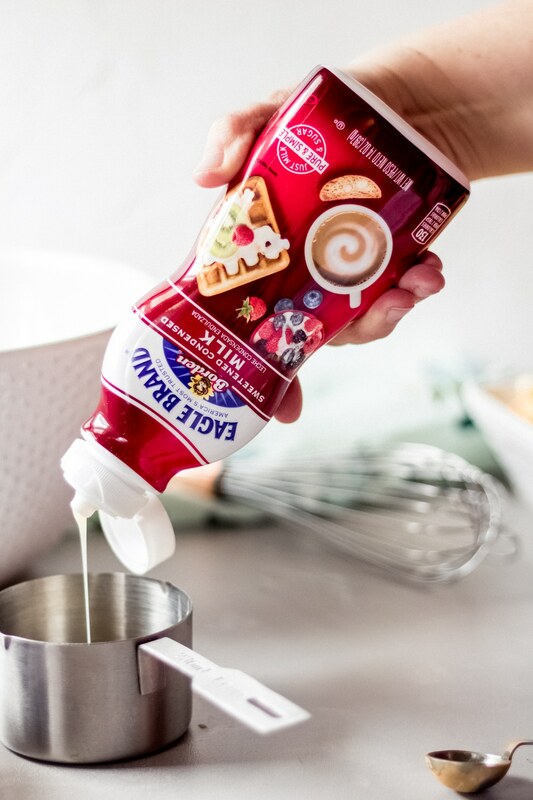 We love Eagle Brand® Sweetened Condensed Milk because it’s just two simple ingredients: milk and sugar. We love knowing what ingredients we’re using in our recipes. Eagle Brand’s sweetened condensed milk was introduced in 1856 by Gail Borden and has been #1 in the sweetened condensed milk category for more than 147 years. Sweetened condensed milk is simply milk from which the water has been removed and sugar has been added. 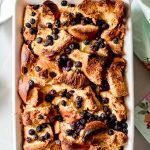 Can I make blueberry french toast bake ahead of time? 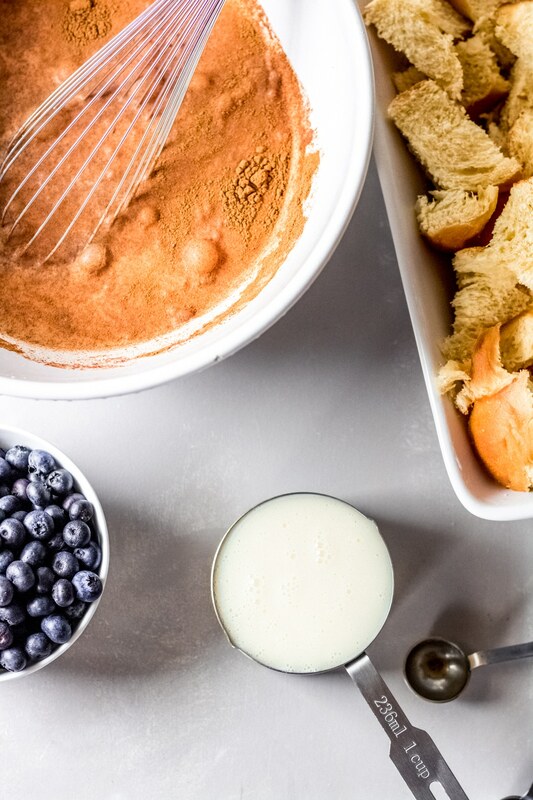 Yes, you can mix together the blueberry french toast bake the night before and store in the refrigerator. Then, simply remove and bake according to the directions on the recipe card. 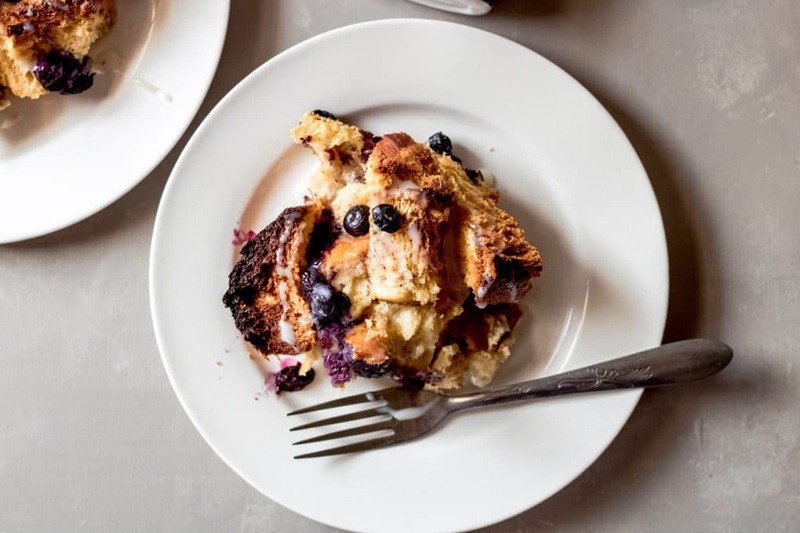 Is this blueberry french toast bake gluten-free? The recipe card below includes directions for both regular and gluten-free. To make the recipe gluten-free, simply use a gluten-free brioche bread. Enjoy these other brunch recipes! 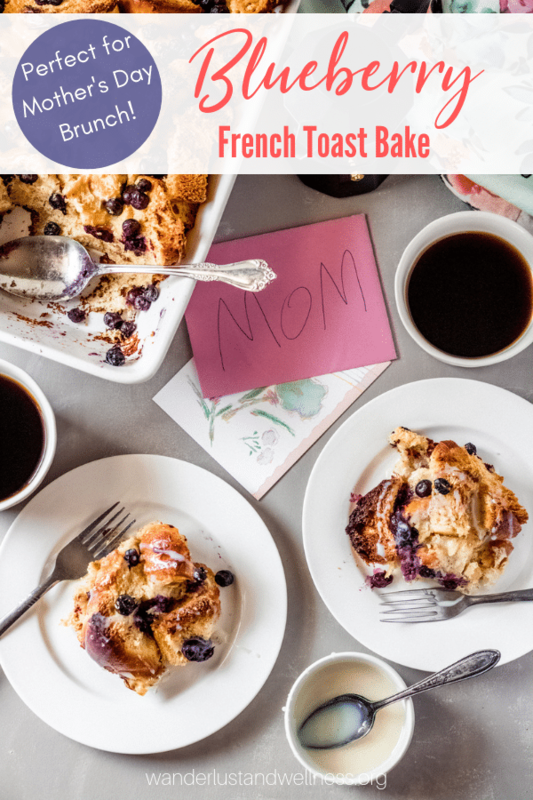 Show Mom how much you appreciate her this Mother’s Day with a delicious blueberry french toast bake featuring Eagle Brand® Squeeze Sweetened Condensed Milk! Grease a 9×13 inch baking dish. Cut the brioche loaf into large squares and add to the greased pan. In a large mixing bowl, add the whole milk, eggs, cinnamon, and salt. Whisk to combine. Measure out 1 cup of Eagle Brand® Squeeze Sweetened Condensed Milk and add to the mixing bowl. Whisk to combine fully. Reserve the remaining sweetened condensed milk for later. Pour the milk and egg mixture over the bread cubes in the 9×13 baking dish. Top with 1 cup fresh blueberries. Bake for 60 minutes or until the center is fully cooked; check with a knife and ensure it comes out clean. If the top of the casserole is getting too brown, you can gently place a sheet of aluminum foil over the top; do not seal the edges down. When finished, remove from oven and let cool for 5 minutes. Serve and top each serving with a little bit of the reserved sweetened condensed milk. A brioche loaf will yield better results than sliced brioche bread. Challah bread would also work nicely. For gluten-free, use a gluten-free brioche bread. I would not suggest making a gluten-free version ahead overnight but rather the day of.